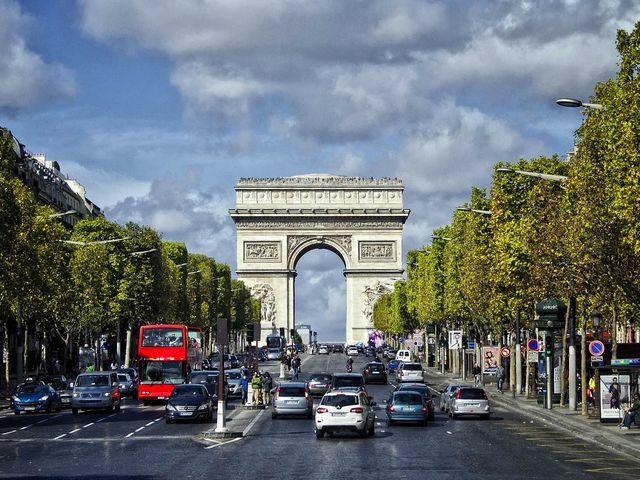 A view from the Champs-Elysees of the famous monument of Paris Arc de Triomphe, situated in the centre of the Place Charles de Gaulle (originally named Place de l'Etoile). It was built by Napoleon in 1836 to celebrate his military victories, with the names of generals, which are carved in the top and inside of the arch. Today, it stands as a tribute to those who fought and died for France during the French Revolution and the wars under Napoleon. In its vault lies the Tomb of the Unknown Soldier from World War I.